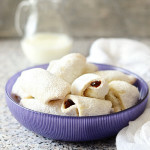 Jam Crescent Cookies (Croatian Kifle) – melt-in-your-mouth, soft and flaky cookies filled with your favorite jam. 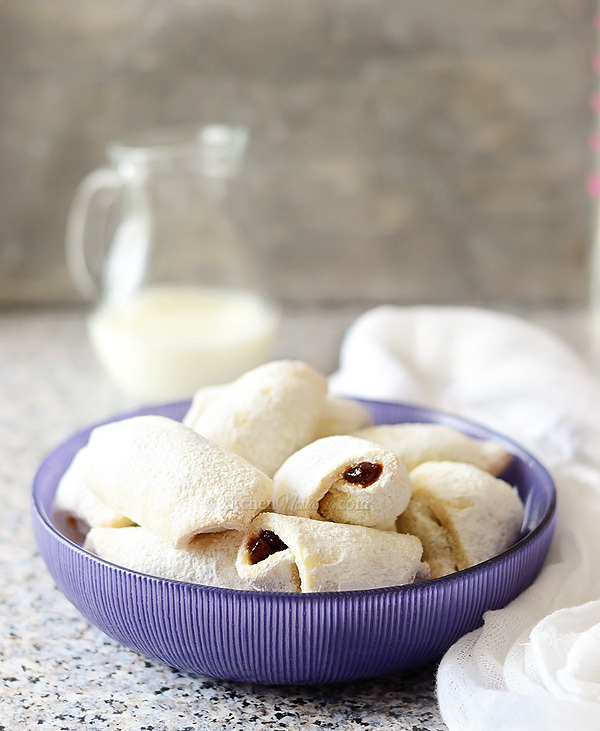 Probably every family in Croatia owns at least one recipe for their favorite Kifle or Kiflice (crescent cookies). 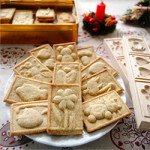 There are so many different kinds: with or without yeast, filled with walnuts, poppy seeds, cheese or jam. The most popular kinds of jam are apricot, plum or rose hip. Some Kifle are more soft and pillowy while others are buttery, flaky or crispy. My recipe is both soft and flaky with slight lemon aroma. This time I used plum jam for filling. You can use strawberry, raspberry, currant or any other jam that you like. Nutella should also work great in this recipe. Kifle are good warm or cold and can be kept for days or even weeks in a closed container. No refrigeration is needed. Kifle can also be frozen. 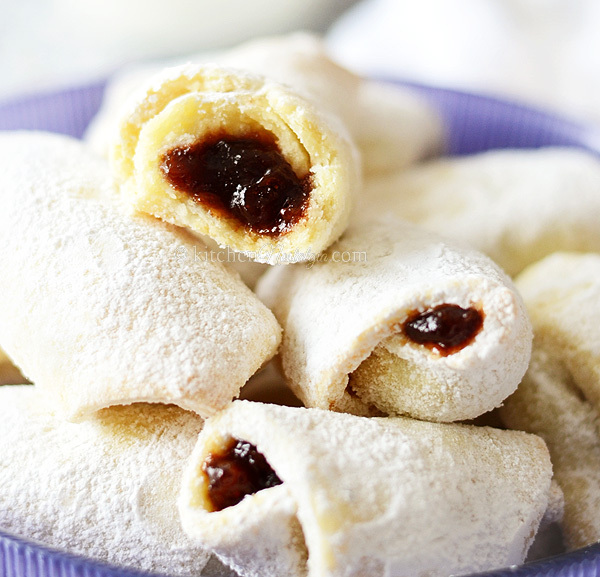 Melt-in-your-mouth jam filled crescent cookies a necessary part of every party, big or small. Mix (either with hands or using mixer or food processor) flour with baking powder, butter, margarine, sour cream, powdered sugar, lemon zest and salt. Do not overwork. Wrap the dough in plastic and chill it in the fridge overnight or for about 1 hour in the freezer. On a lightly floured surface, roll one-fourth of the dough into a thin circle. Cut the circle into 6 triangles and put about 1/2 teaspoon jam on each one. 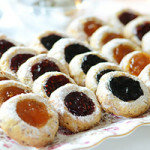 Jam should be firm rather then runny so that it does not spill out from cookies. Roll triangles into crescents, starting at the wide end (see video below for instructions). Arrange cookies on a baking sheet (they won’t expand a lot). Bake them in preheated 350 F (175 C) oven for about 15 minutes in regular oven or about 12 minutes in fan oven. They should still remain pale in color. 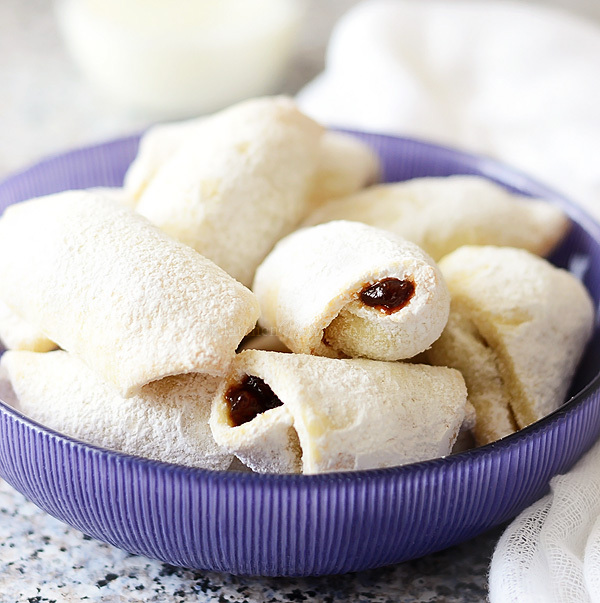 Transfer the crescents to a wire rack and dust them with powdered sugar. They look absolutely perfect. An ideal afternoon snacking cookie! They are! I can’t stop eating them. 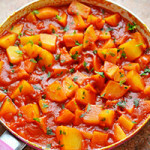 Thank you for all your efforts, love reading and making your receipes, I’m born Australian from Croatian parents, though I make many Croatian meals and sweets; I’m always looking for it to me perfect and loving someone giving me exact amounts lol ( not just a bit of this, hand full of this) 🙂 lol. Yes, I have. I will have to post them some time. Could you please clarify the amount of butter/margarine to use. 250 grams butter or margarine. Thank you very much for your prompt reply to my first question. I apologize, but I just realized that I have two more questions. Should the butter be cold or at room temperature? How many inches should the circle of dough be when rolled? Thank you for answering my questions, I really appreciate it. I can’t wsit to make your cookues. It is better that butter is cold because dough will be more flaky. The circle of the dough should be approximately 10 inches wide. Please look at the video above from 2:40 minutes to get the feeling about the size. Is pastry flour the same as all purpose flour or is it something else? Pastry flour has lower percentage of protein, about around 7-8 percent, then all-purpose flour. It produces lighter, more tender pastries. 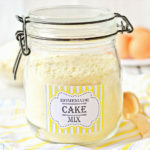 You can substitute it by mixing 1 cup of all-purpose flour (minus 2 tablespoons) with 2 tablespoons of cornstarch.